Les Lauriers de Magnot: Switzerland - Yearly Train Pass for Your DOGGIE with Swiss Federal Railways (SBB)! 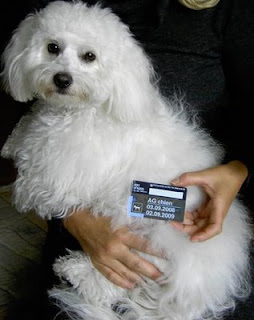 Switzerland - Yearly Train Pass for Your DOGGIE with Swiss Federal Railways (SBB)! You don't want to leave your best friend all alone at home while you go off for a day out by train? No problem: your trusty canine is welcome on Swiss trains too! Those who wish to take their four-legged friend with them can purchase a yearly train pass (GA) for Dogs for just CHF 650 (around US$ 580 - 14 Sept 2008). Please observe that your doggie may travel in BOTH, 1st or 2nd class on the train, every day of the year, during the time period in which the GA is valid! Please note otherwise that small dogs, up to 30 cm (around 12 inches) high at the shoulder, may travel with you free of charge as hand luggage provided that they are in a carrier bag, basket or other suitable container! Have a safe trip and don't upset your best friend, first class please! The French version may be found here and the Spanish here.